Through education and involvement, the American Wildlife Foundation is dedicated to teaching people to care for and about the environment. The interests of AWF are worldwide; its focus is on the local communities. We believe that people are most strongly influenced by what they can see, hear, and experience. AWF strives to teach people that our world’s most valuable treasures are in their hands; that every day actions, even ones that seem small, actually can make a difference. AWF fosters grand scale conservation as it is done best, one person at a time. 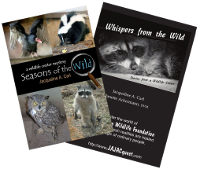 Informs and educates people about wild animals and ecosystem conservation. Promotes research and continuing education for animal care and conservation professionals. Assists and supports local, national and international organizations dedicated to promoting wildlife care and conservation. Reduce, Reuse, Recycle. It makes a difference!